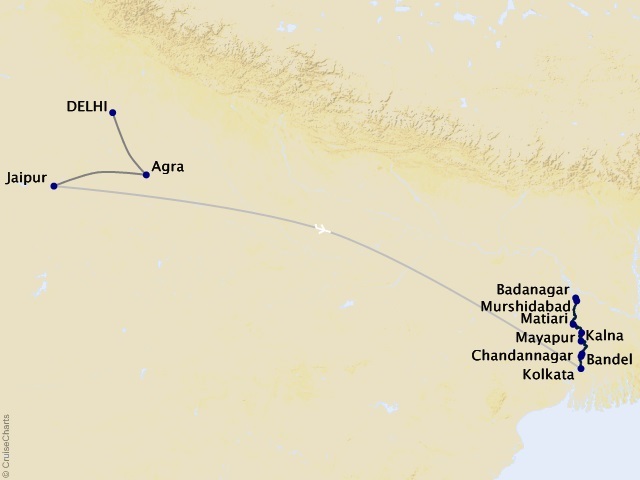 Departing from Delhi (New Delhi) on November 19, 2020. Profoundly mysterious and gloriously exotic, there is no better way to delve as deeply into India’s fascinating historical and religious heritage than a river cruise on Uniworld's Ganges Voyager II. Wondrous sights rich in romance and intrigue come alive in the “Golden Triangle”—Delhi, Jaipur and Agra—and you will see it all in style, safety, and in spacious accommodations. Ganges Voyager II boasts high-ceilinged suites are a serene sanctuary, with beautiful hand-painted murals and all the comforts of a five-star hotel. All suites have a cozy sitting area and a French balcony with floor-to-ceiling glass doors, roomy bathrooms with rain shower, comfy robes and slippers, and spa-quality bath products. Plus all the modern touches that will make this one-of-a-kind journey through the heart of India even more spectacular.